A circle of ten interacting lasers (left) can cleanly synchronize their phases, as shown by the sharp distinctions between light and dark rings near the center. 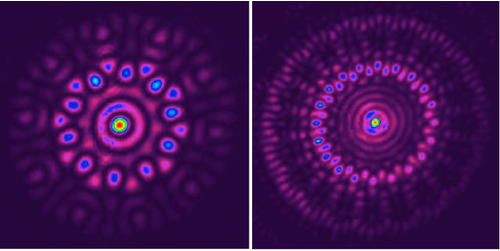 But using 20 lasers (right) leads to a 20% likelihood for topological defects, where each laser’s phase is offset from its neighbors’, leading to light and dark rings that are less sharply defined. V. Pal et al., Phys. Rev. Lett. (2017). If you cool molten iron slowly, the electron spins can gradually align in a single direction and produce a strong magnetic field. But rapid cooling leads to magnetic domains aligned in various directions, separated by thin boundaries called topological defects. A similar phenomenon may have occurred as the Universe rapidly cooled after the big bang. To study topological defect formation in the lab without the challenges of temperature control, Nir Davidson and colleagues at the Weizmann Institute, Israel, have now developed an experimental model involving interacting laser beams. To create their experimental model, Davidson and colleagues placed a disk containing between 10 and 30 holes arranged in a circle inside a laser cavity. This “mask” produced a set of laser beams, each emerging from a different hole and leaking a bit into its two neighboring beams, generating interactions. These interactions caused the phase differences among the beams to change over time. The evolution was so rapid that the team simply observed the final state, by recording the resulting pattern of laser intensities. This state represented the combined effects of about 1000 different longitudinal modes in the cavity—essentially 1000 independent experiments running simultaneously, each with a different set of initial phase relationships among the lasers. In many cases, the beams quickly synchronized their phases, but for some initial phase relationships, the beams would get “stuck” in a state where each beam was a fixed phase away from its neighbors. The team showed that, with ten lasers, there are exactly eight of these topological defect states. Analysis of the laser patterns allowed the researchers to measure the likelihood of topological defect formation as they varied parameters such as the number of lasers in the ring and the power of the pump light inside the cavity. They found that, with increasing pump power, topological defects became increasingly likely. The team explains this result with simulations showing that the variations in intensity among the beams drop rapidly in time when the pump power is high, whereas low power is associated with slower intensity equilibration. They say that the slower equilibration is the equivalent of a slower cooling rate, and thus, a lower likelihood for topological defects.